Infographics are a great way to present information in a way that’s easy for most people to understand. A lot of people learn visually, and can get a better grasp on what you’re trying to say if you display it graphically. As designers, infographics can present information to us that benefits our design businesses, and gives us more insight into the technologies we depend on for our livelihoods. Below are fifty infographics that are useful and/or interesting, and pertain directly to the world of web design. 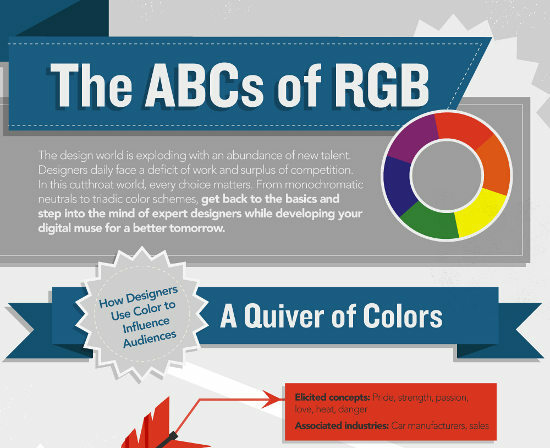 Color Theory: The ABC’s of RGB is a comprehensive breakdown of the RGB color model. A helpful guide for all those working in the web. The Darwinian Evolution of Photoshop — This infographic shows the evolution of Photoshop, including all twelve major releases and the differences between them. The Journey of a Tweet — This infographic shows the potential journey of a photo posted to Twitter across social media and the rest of the web. The Biggest Shift Since the Industrial Revolution — This infographic shows the shift in content and relationships as they move to social media. Are We Addicted to the Internet? — Here’s an extensive infographic talking about the level of Internet usage in the U.S. and potential signs and levels of addiction. Marketing With the Masses: The Science of Word of Mouth — This infographic breaks down the effects of word of mouth marketing, as well as how it works and where it happens. Going Local — This infographic, created for GigaOM by Column Five Media, shows the market share and other information for six of the most popular location-based web services (Gowalla, Foursquare, MyTown, Where.com, Brightkite, and Geodelic). All You Need to Know About Web Designers — Here’s an interesting graphic that breaks down the demographics of web designers worldwide. Why Brands Cannot Ignore Social Media Mavens — This informal infographic showcases why social media mavens are vital to a brand’s online marketing success. B2B Social Media Marketing — Here’s an infographic that illustrates statistics about business to business social media marketing, including future predictions and effectiveness of different channels. Everbody’s Doing It: How Marketers Are Utilizing Social Media in 2010 — This infographic offers an overview of how companies are using social media to market themselves and their products, as well as their attitudes toward social media. Anatomy of a Search Marketer — This infographic from SEOmoz illustrates the answers to their 2010 SEO Industry Survey. DIY Guide to Successful Linkbait Infographic — Infographics can be used to provide instruction as well as just presenting facts. This example does a great job of providing step-by-step instructions for creating popular web content. Why Do We Follow Companies on Twitter? — This simple infographic breaks down results of a survey of 1500 consumers about what their motivations are for following brands on Twitter. The Business Behind Facebook — Ever wondered how Facebook makes their money and what their business model is based on? This infographic explains it all in general terms and actual dollar figures. Understanding Google PageRank — This infographic shows exactly how the Google PageRank system works, including how different types of incoming links affect your rank differently. A Guide to Internet Memes — Here’s an infographic that shows a variety of popular memes, starting with The Dancing Baby and including Rickrolling and The Hamster Dance, with history for each meme. The Most Popular Design Blogs by Twitter Followers and Facebook Fans — Here’s a great infographic that shows the most popular design-related blogs out there, displayed based on their Twitter followers and Facebook fans. History of the Internet — Here’s an interesting infographic that shows some of the major milestones in the history of the Internet, starting in 1962. Famous Rivalries: Facebook vs. Everyone — This infographic shows the history of Facebook’s rivalries with other online services. How Android is Taking Over — This infographic from GigaOm showcases how Android smartphones are gaining market share and are likely to continue doing so by comparing all of the major smartphone OSs. Google vs. Apple — This GigaOm infographic shows the rivalry between Google and Apple, in timeline form. The App Store Economy — Here’s an infographic from early 2010 that shows the economy built around Apple’s App Store, by the numbers. 2010 Cloud Computing State of the Union — This infographic showcases what’s happening in the world of cloud computing and virtualization, based on a survey done by Zenoss. The Social Buying Universe — Here’s an infographic that showcases the world of social buying, including services like Groupon and Living Social, and their influence. The Rise of the Cloud — This infographic from GigaOm illustrates the demand for web-based software and storage, as well as public sentiment toward those services. How to Get Rid of Villains in Social Media — This infographic, based on Todd Heim’s post “8 Villains of Social Media“, shows how to defeat the villains present in social media, including skeptics, trolls, and shameless link droppers. Meet iPad’s Competition — This infographic shows what the iPad’s main competition is in the world of computing, gaming, and e-readers. Social Marketing Compass — This infographic shows the different aspects of social media marketing, and which areas different types of users should be focusing on. The Hierarchy of Digital Distractions — Here’s an infographic similar to Maslow’s Hierarhcy of Needs, but instead illustrates common digital distractions (like Twitter, email, and different kinds of users). Flickr User Model — Here’s a visual look at the Flickr user model, and what potentially happens to a photo once it’s posted to Flickr. Facebook Factbook — Here’s a visual look at the first six years of Facebook and it’s phenomenal growth. The Social Media Effect — This infographic shows what can potentially happen to online content once it starts being passed around the various social media channels. Internet Censorship — This infographic shows the state of Internet censorship around the world as of 2010, including which countries most heavily censor their internet users. How Google Works — This infographic shows how Google indexes and ranks content on the Internet, in flow-chart format. The CMO’s Guide to the Social Landscape — This infographic shows what different social media services are good for different kinds of content marketing (customer communication, brand exposure, driving traffic to your site, and SEO). What Are People Really Buying Online — This pie-chart style infographic shows what people really purchase online, and compares it to what they buy in-store. Who Participates and What People Are Doing Online — This chart shows the different kinds of internet users and what they actually do online. Casting a Wider Net with Social Media — This simple infographic illustrates how publishing to and sharing content from social media sites can increase your site’s traffic. Building a Company with Social Media — This infographic shows how social media can be used by each department in a company to build that company. The Blogosphere We Call Home — This infographic breaks down the blogosphere in terms of who’s blogging, what they’re blogging about, and how much time they’re spending doing it. U.S. Data Consumption in One Day — This is an amazing infographic that shows how much data is consumed by people in the U.S. in a single day. Five Years in History of Online Video — This infographic shows the prevalence of online video and how it changed between 2004 and 2009. Profile of a Twitter User — This infographic shows the most common kinds of Twitter users and what to do with them. How Much Time is Wasted on Loading Unnecessary Data? — Since broadband Internet access is pretty much the norm these days, a lot of designers have stopped paying so much attention to file sizes and load times. This infographic shows just how much time and bandwidth is wasted by all the unnecessary data that loads on a website. How Do Colors Affect Purchases? — by KISSmetrics, shows us what impact colors have on the buying decisions of online shoppers. An invaluable resource for ecommerce designers. 8 Levels of Information Technology Security — This infographic shows potential threats to IT security in a data center, as well as the typical methods used to combat them. Global Downloads Speed Comparison — This infographic compares the various typical download speeds from all over the world. How Popular is the iPhone Anyway — This infographic shows the popularity of the iPhone in terms of sales, market share, number of apps downloaded, and more. Operation E-Commerce: A Game of Dissecting the Best E-Commerce Software — This infographic illustrates the necessary features of great e-commerce software, all built around the classic Operation board game. Colours in Cultures — Here’s a handy infographic that shows what the meanings of different colors are in different cultures, including Western/American, Japanese, Hindu, Native American, Chinese, Eastern European, Muslim, and others. Awesome post! There are some really interesting bits of information here. Thanks! Well, there goes my sleep for the night. Thanks for rounding these up! Great post, thanks for sharing it with all of us. Very useful infographics. Thanks for sharing! These infographics have a lot of great information! Thanks for sharing.